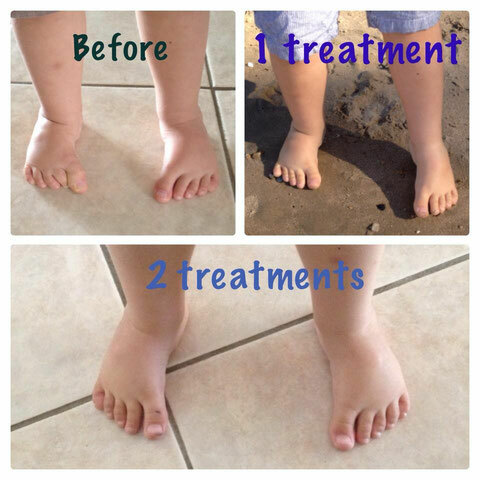 CLUBFOOT - Emmett Technique Cairns Muscular Release Therapy, Australian made. Just a Little Emmett Can Create Lovely Change. I would like to introduce you to a new friend of mine I met him maybe 3 weeks ago now when his mum sent me this message through facebook. Hi there, I have a son who is nearly 3 years old. I saw Abigail's post on your wall and I realised it was the second time I've come across your page. I don't know Abigail personally but I have messaged her as I can relate to the journey she is about to begin with clubfoot. My son was diagnosed at cairns base 18 weeks into my pregnancy, with bilateral club foot. We moved to vic late in my pregnancy to get him the best care. He was casted for 4 weeks at 6 months old. Luckily for us the clubfoot was a mild case. The casting seems to have corrected his clubfoot but he is left with metatarsus adductus- more severe in the right foot than his left. We moved back to cairns after we thought his treatment was finished and now after two appointments, a year apart, I'm tired of being told to wait and see. We are due for another appointment in October and if they tell me to wait again I'll be seeking a referral to a top specialist in Brisbane. From what I've seen on your page I assume that you work with muscles and pressure points. If the arches in my sons feet are too tight to let his feet straighten out do you think, there could maybe possibly be a chance, you could help him? I'm willing to try anything. Please let me know if you think he could benefit at all from your work. It would ease a pain in my heart that is growing every day in the fear and thought that he will have to be casted again because I let them keep telling me to wait. Please. Thank you for your time.